Who does not love Penguins. 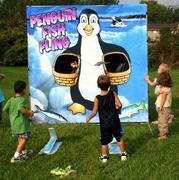 This Penguin Fish Fling carnival game is sure to be a huge hit with kids of all ages! Children stomp on the launcher, flipping the rubber fish into the penguin's picnic basket. See how many you can get in!